Click on areas of interest to view details. Pepi I, 2nd king of the 6th dynasty, son of Teti, ruled the Two Lands for some 34 years. Today the pyramid of Pepi I is a pile of stone just 12 meters high. But in it's heyday Pepi's I pyramid dazzled contemporaries and of all the Egyptian pyramids may be the one that has most deeply put it's stamp on history. The pyramid called Men-nefer-Pipi, 'Stable and Perfect' is the root for the name of Memphis now used to indicate the capital of the Old Kingdom. In ancient times the capital was known as Ineb-hedj, or the white wall. 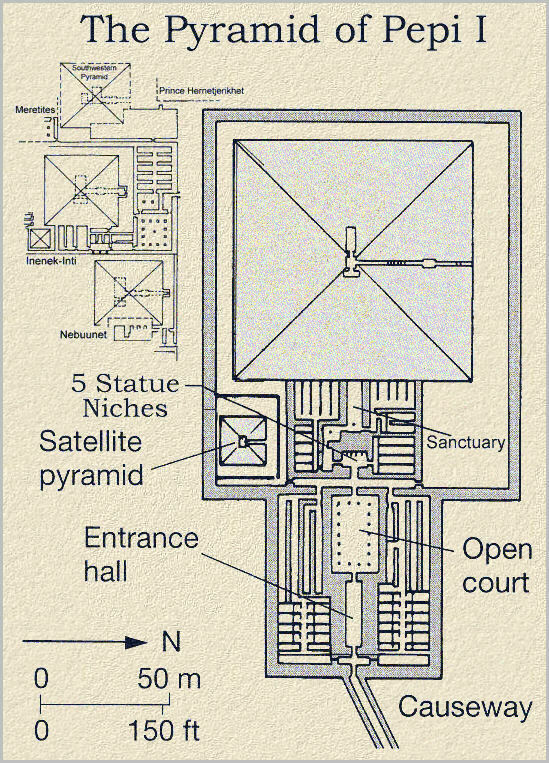 The six step pyramid core was constructed in much the same way as others since Djedkare's, by using small pieces of limestone bound by clay mortar. Many builder's marks and inscriptions were found on the limestone masonry of the core. The casing of fine white limestone is intact on only the three bottom layers. On the south side were discovered 6 queens pyramids with potentially more to be discovered. These were recently excavated and show much detail. The courtyard has many granite blocks with Pepi's I cartouche. Important discoveries were made there, limestone statues of Egyptian enemies kneeling with their hands tied behind their back among them.